as they are annually celebrated. Winter Solstice holidays have been with us for thousands of years, begun at the dawn of agriculture among people who depended upon the return of the sun. Many of these holidays celebrate light literally, but for many, there is also the symbolic meaning of light ~ Wisdom. For people all over the world, these holidays must remind us that darkness must yield to light. The sun does come back, and spring will follow winter. We can help the process, as our ancestors thought they did, by loving each other, and each of us living our life as a candle dispersing the darkness. A Jewish festival celebrated at this time of year, Hanukkah started out as a minor holiday focused on an historic event, the rededicating of a temple after driving out the Greek invaders who had desecrated it. According to the accompanying legend, there was only enough sacred oil in the temple to burn for one night, but it miraculously burned for eight days, until new oil could be brought in. American Jews have taken this holiday to new heights. It is difficult to live in the shadow of Americas enormously appealing Christmas festival, but Hanukkah has met the challenge. In an eight-day celebration with gifts given to the household children each of the eight days, lighting a new candle each night is a significant part of the celebration. "Do not curse the darkness; light a candle in the world." The light, of course, represents knowledge and wisdom. Hanukkah foods are full of symbolism. The favorite potato pancake is a golden symbol of the sun, and the oil in which it fries is a reminder of the sacred oil that gave its all for the temple. No, the potato pancake is not an ancient food; the potato came form Peru and was not a part of the European diet until the 18th century or later. Hannukah is celebrated around the world for eight days and nights, beginning on the 25th day of the month of Kislev on the Hebrew calendar and ending on the second day of the Hebrew month of Tevet. In 2017, Hannukah begins on the evening of December 13 and ends on December 21. Thoughts and meditations about Hanukkah, the Festival of Lights. As I understand, it has its origins in a battle that liberated Jerusalem and the Temple there around 167 B.C. When the elders went to light the Temple's lamp, there was only enough oil for one day yet the lamp burned for eight days, this miracle became known as the "Festival of Light" or Hanukkah, lasting eight days. While meditating on this miracle two thoughts came to me. One, on a community or global level this festival could symbolize the ending of the fear that there is not enough. When the elders came upon the lamp there was only a small amount of oil, only enough for one day. Yet this small amount of oil burned brightly in the temple for eight days, providing light for all those who entered. Let us light such lights in our communities and in our world, symbolizing that there is enough and we will share it with all. And on a personal level this miracle of light speaks to us also. It asks us to bring the light to the dark places in ourselves and in our world even when we think we cannot. It asks us to continue to shine when there seems not enough. This miracle speaks of a great faith and of our steadfastness in a higher purpose. Let us all be a part of this Festival of Light sharing the light in relevant and thoughtful ways, and in doing this we enter the realm of miracles. Many of us think that we have always celebrated our Solstice holiday, Christmas, in the way we do today ~ with a massive show of light. We illuminate Christmas trees, decorate our houses and gardens with strings of light, burn candles throughout our homes and logs in our fireplaces, and light up our city streets. What started as a holy mass in Europe, probably at the time assigned to the birth of Jesus (probably April) was moved back to the Winter Solstice by church fathers to serve several needs. The early church was in competition with the Pagan holiday of the Romans, the Saturnalia, which still exists in our New Year celebrations featuring Father Time ~ Saturn. They were also in hot competition with the Mithra Cult, a spinoff of Zorastrianism, which was a favorite of Roman soldiers. The Mithra Cult was devoted to worship of the sun, which comes down to us today in the Christian Sabbath day ~ Sunday. During the Dark Ages, as northern Europes pagans were converted en masse to Christianity, the church found it difficult to stamp out pagan practices that were dear to the new converts. The many gods and goddesses were converted to saints to whom a good Christian could pray, and even the most primitive totemic practices were absorbed into the new Christmas festival. 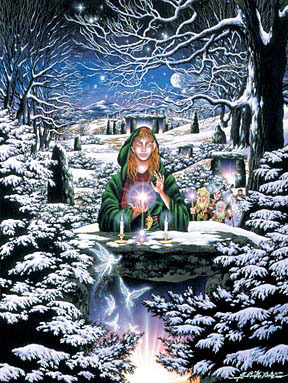 The Germanic tribes worshipped the evergreen green ~ a symbol of eternal life ~ and the Druids, of what would later be France and England, revered the mistletoe, an oak parasite associated with fertility. We still believe it is lucky to kiss under some mistletoe. The Yule Log, the great log, making a brilliant fire in the hearth of the local lord, had its roots in another Druid custom: rolling a flaming wheel down a hill on Winter Solstice night, to show the sun how to come back. This flaming wheel ceremony is still found in remote parts of Europe. Now, what about the symbolic significance of light? The more sophisticated worshippers in the past always recognized that light is associated with wisdom. Being "in the dark" of living in darkness has always meant ignorance and the twin of ignorance, fear. Being illuminated or having a luminous soul means understanding the true meaning of life. Part of the Christian lore of light at this darkest time of year has always meant living in Gods light. The traditional foods of Christmas also have great symbolic meaning. The fruitcake originated during the Crusades when the European soldiers sent home the wonderful dried fruits of the Muslim East. The custom of putting "sugar plum" in the stockings of good children also dates from the Crusades. Amidst the joyful traditions and the hustle and bustle of Christmas, I have learned to look inward. Seeing Christmas as an inner experience, as an inner birth. It is a miracle that took place long ago, and one that is repeated again and again in our hearts and minds, as we awaken to the Christ spirit within us. This divine spirit once recognized is a light that guides, a life which revitalizes and a love which blesses. May the inner light, life and love of Christmas be with you now and always. The heat of early summer impacts the way Australians celebrate Christmas and how northern hemisphere Christmas traditions are followed there. In the weeks leading up to Christmas houses are decorated, greetings cards sent out, carols sung, Christmas trees installed in homes, schools and public places, and children delight in anticipating a visit from Santa Claus. On Christmas Day family and friends gather to exchange gifts and enjoy special Christmas food. Many Australians spend Christmas out of doors, going to the beach for the day or heading to campgrounds for a longer break over the holiday period. It has become traditional for international visitors who are in Sydney at Christmastime to go to Bondi Beach, where up to 40,000 people visit on Christmas Day. Because the earth is oriented to the north pole star, the symbolism of the returning light applies to both the northern and southern hemispheres. Hence after the three day period of "trials and tribulations", Christmas day is celebrated — we access our Christmas "presence"; the Sun no longer appears to be "standing still" — it is moving "northward". The symbolism of the (northern winter) solstice tells us that just after the hour of humanity’s greatest darkness (the longest night of the year), there follows the waxing light toward the next quarter of the year at the spring equinox in Aries. The Christian or American way of celebrating Christmas has become so attractive around the world that many who are not Christian have taken it up. The Japanese have adopted Christmas, complete with trees, lights, gifts, and family celebrations. So have many of the educated middle-class Indians in the subcontinent. Before the Islamic Revolution in Iran, the Christmas tree was becoming a common feature of the westernized community. In Europe, Christmas celebrations combine the older and newer traditions. In the northern countries, where the Winter Solstice brings long dark nights with it, light is an essential element in keeping people from winter depression. One of the great differences between Europe and the old Soviet Union during the Cold War was the contrast between Helsinki and Leningrad. Christian Finland celebrated the Christmas season with a riot of lights everywhere, while Marxist Leningrad was drab and dark. This has changed since the Berlin Wall came down. The Russians and others with traditions from the Eastern Orthodox Christianity celebrate Christmas on January 6, and Father Frost substitutes for Santa Claus. Gifts and festive foods are an important part of these celebrations. In Italy there is a charming custom for Christmas Eve ~ a feast that features seven varieties of fish. Evidently Christmas Eve was a fast day in Medieval Europe, on which no meat should be eaten. Meat was for Christmas Day itself. The fish have another significance: a reminder that Jesus was a fisher of souls ~ and that the sign of the fish was an early Christian symbol for identifying other Christians. This new holiday has grown in popularity among the ethnically aware African-American community. The holiday is not attempting to co-opt Christmas, which is overwhelming in this American culture, but is following the lead of Hanukkah in providing an ethnically meaningful celebration of light. Like Hanukkah, Kwanzaa is a one-week celebration that features light (candles) and gifts, and the harvest foods of Africa. The holiday is an opportunity to focus on moral values that have their origins in African village tradition. First celebrated in 1966, every year since then Kwanzaa is celebrated from December 26 through January 1. Each day of Kwanzaa is dedicated to one of the seven principles: unity, self-determination, collective work and responsibility, cooperative economics, purpose, creativity, and faith. The holiday concludes with a community feast featuring traditional African food, ceremonies honoring the ancestors, assessing the old year and committing to the new year, performances, music and dancing. This is one more festival that Americans can enjoy at this season of darkness. Hindus in India, and all over the world, celebrate Diwali (or Deepawali), a festival of lights that is as big as Christmas is for Christians. The festival commemorates the destruction of the evil king Ravana by the good king Rama, who then returned to his kingdom in Ayodhya, to be welcomed by all the people, who light up their homes with candles. The Diwali Festival symbolizes the victory of good over evil. Besides Hinduism, it is considered a significant festival to Sikhs, Buddhists, and Jains. Celebrated on December 13, Santa Lucia Day is an important prequel to Christmas in many parts of the world. The Feast of Santa Lucia, St. Lucy, is observed in Sweden as well as in Italy and Croatia. Santa Lucia Day is also an international holiday, celebrated not only in Scandinavia, but also in Italy and France in the rites of the church. The Lucia tradition can be traced back both to Saint Lucia of Syracuse, the martyr who died in 304, and beyond that to the Swedish legend of Lucia as Adam’s first wife. It is said that she consorted with the devil and that her children were invisible infernals. Thus the name Lucia may be associated with both lux (light) and Lucifer (Satan). The present custom appears to be a blend of traditions. In the old almanac, Lucia Night was the longest of the year. It was a dangerous night when supernatural beings were abroad and all animals could speak. By morning, the livestock needed extra feed. People, too, needed extra nourishment and were urged to eat seven or nine hearty breakfasts. This kind of feasting presaged the Christmas fast, which began on Lucia Day. Throughout Sweden, the festival of Santa Lucia begins before dawn. The eldest daughter in each household, dressed in a long white gown tied with a red sash, and wearing a crown of lingonberry leaves in which are set seven lighted candles, comes to her sleeping parents. The procession includes her sisters and brothers also dressed in white, holding lighted candles, and singing of the light and joy of Christmas. Awakened by the lights and the singing, the parents arise and eat the served breakfast, thus ushering in the Christmas season. Scandinavian tradition holds that in Värmland, Sweden, a white-clad maiden, wearing a crown of burning candles, brought food to the starving villagers on the shores of Lake Vänern. It is unknown how long ago the tradition began, but it was so far back that the festival of Santa Lucia was marked by a notch on the primitive "primstav" (calendar stick), the precursor of the calendar. From its beginnings in Värmland, the customs in honor of Santa Lucia have spread throughout Sweden, and more recently to the rest of Scandinavia. Today the festival is celebrated in schools, hospitals, businesses, and towns, each of which has its own Lucia and festivities to mark the beginning of Christmas. In Italy, torchlight processions and bonfires mark her day, and bowls of a cooked wheat porridge known as cuccia are eaten because, during a famine, the people of Syracuse invoked St. Lucia, who interceded by sending a ship laden with grain. Not very long after Winter Solstice is the celebration among Chinese everywhere of the New Year. Again, this is a festival of light, with fireworks and lanterns, visits and gifts. The moon plays the major light role here, with foods that are shaped like the full moon (scallops, golden round dumplings, anything round) and money wrapped in red or gold paper. Courting good luck is the center of all customs surrounding the new year. Chinese New Year, or the lunar new year, is observed each year at the (first) new moon in Aquarius. Chinese New Year celebrations take place everywhere that the Chinese live in their diaspora around the world. Vietnamese, Chinese, Malaysian Chinese, and Indonesian Chinese celebrate in the same way. In Iran, which today is a predominantly Muslim and Shiite country, the Muslims never succeeded in stamping out all the practices of the countrys ancient religion, Zoroastrianism. Witness to this is the Persian New Year Nowrooz, celebrated on March 21. This 13-day celebration of nature, gifts, special foods, and the visiting of friends and relatives, was frowned on by the late Ayatollah Khomeini as "un-Islamic." Indeed it is, but Iranians refused to give it up. A lesser-known Zoroastrian holiday is the celebration of the Winter Solstice. On December 21, when snow blankets much of Iran, Persians sit around low tables covered by quilts with a charcoal brazier underneath. Religions and their symbols have a way of changing over time. Unlike the Japanese, whose art reflects their love for all seasons of the year, Persian art totally denies winter. Imagine summer in winter. I remember as a young bride having my toes warmed under the table while the quilt kept out the rooms cold. A watermelon saved in straw in the larder from summer was brought out to be eaten by the family: the taste of summer in the middle of winter. in the Prophet Zoroasters time, a winter solstice festival would have been like those seen in pockets of northern Europe; celebrating fire and remembering that the sun will return. Main text excerpted and adapted from "Festivals of Light"